I've often said how I would like to visit some of the shoppers whose lists I have in the Compendium. Sometimes I find their addresses on old envelopes, sometimes on business letterheads. 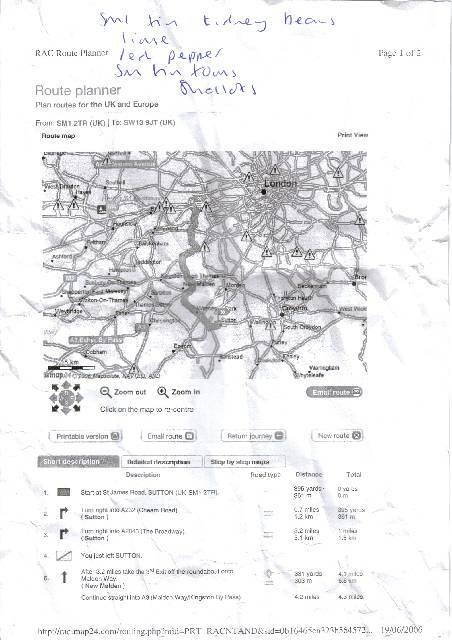 But never before have I been given a map! Yep, check it out: this is a map from SM1 2TR (St James Road, Sutton) to SW13 9JT, which according to www.streetmap.co.uk is St Paul's School in Hammersmith. 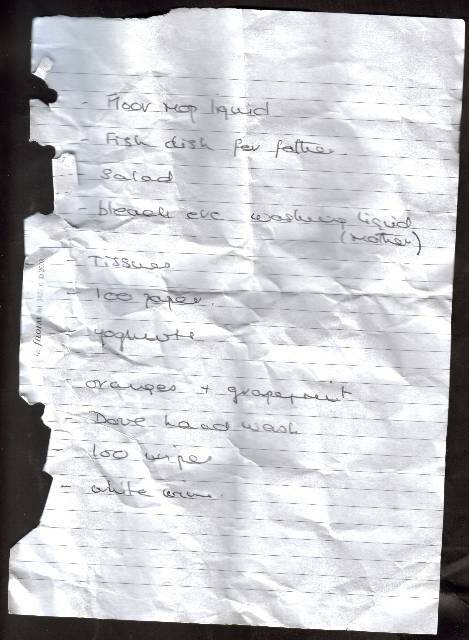 Now, this is interesting because a colleague has just got a new job teaching there...but it's unlikely that she was shopping at New Malden Tesco for a few random bits and bobs (presumably to make chilli con carne) which is where this list was found. Still, at least if I ever want to visit her new place I know how to get there. If I'm starting from Sutton, that is. You don't find people referred to as "father" and "mother" very much these days. You find "father" and "mother" referred to even less on shopping lists, but that's not to say it never happens - as this list shows. Something fishy is definitely going on here. The shopper is clearly the offspring of the "father" and "mother" mentioned here, but is buying quite shockingly different things for each of their parents. "Fish dish for father" is fair enough. Dads like fish. But, "bleach etc washing liquid (mother)" is a bit scary. Could this be a very dirty mother who needs a bloody good clean, or is it the shopper's attempt to kill off the mother for the inheritance? After all, father gets food while mother gets bleach. The shopper has planned this murder well (and it wouldn't be the first time a murder has been solved through the evidence of a shopping list). In addition to the bleach to poison mother, they have also got "Tissues", "loo paper" and "loo wipes" to ensure all mess is quickly and effectively cleared up along with the "Floor mop liquid". Once that's done, the "Dove hand wash" will rid the final remnants of any evidence down the drain. "White wine" to celebrate the dastardly deed, perhaps? This is a list. Oh yes it is. And it's not just any old list, it's a THISISAKNIFE list. I've just got back from Tesco with the nice chaps from Channel 4's weekly videocast, thisisaknife who featured the Compendium in January. Donal, Tim and I wandered around the trolleys searching out more lists while they recorded a nice little interview for this week's show. As for the list, there's a couple of things that stand out. One of them is the fact that "Bread" is written - not only in black pen rather than a pencil - but aso in different handwriting. The second exciting thing is that this is a shopper who either wishes to buy a straight caddy for tea, or maybe already has the caddy but wants some tea leaves for it. How very confusing! You can tell it's summer though - lots of "Salad" and things, although quite why "cucumber" needs to be listed separately is slightly inconsistent. Yet again, my deciphering skills have left a little to be desired. While I can make out the majority of this list, the odd word escapes me. Or, in the case of the seemingly "Musical Fangs", both words. Most websites I've found on this topic refer to people sinking their "musical fangs" into stageshows, most of which seem kitschly camp like Rocky Horror. But I don't think Tesco would take too kindly to me shopping in a basque and fishnets. The BBC broadcast a cookery program called Ready, Steady, Cook. Anthony Worrall-Thompson crops up on it on occasion (not to be confused with Dr Anthony Worrall at the University of Reading), along with an assortment of other "celebrity chefs" who take it in turns to make a meal out of a bunch of supposedly-random ingredients. 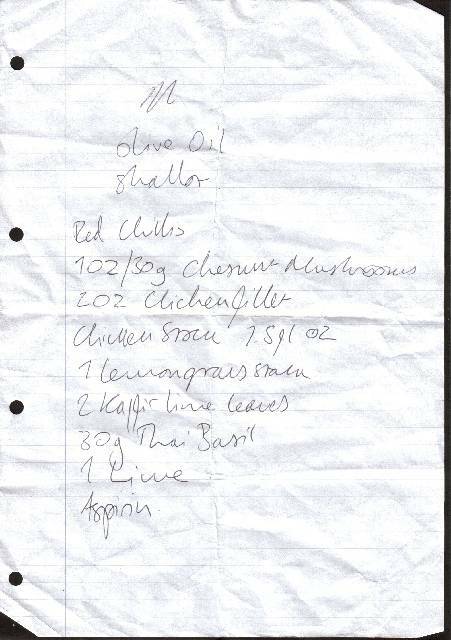 This shopper clearly watches it, as the recipe listed on this A4 sheet is a perfect recreation of Brian Turner's Thai Chicken Soup. 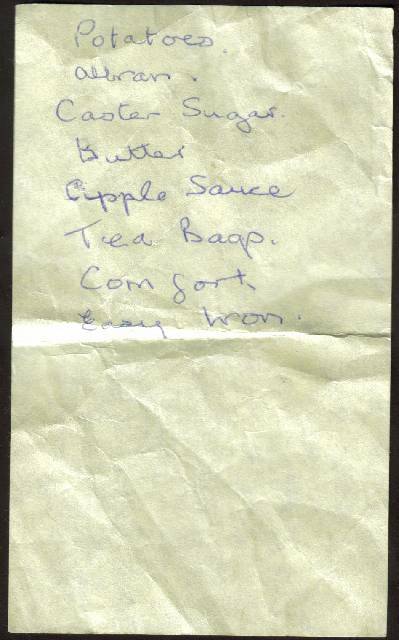 In fact, you can even see the frantic scribbling on this list, as the shopper copied down the ingredients during the program. It must be stressful making soup. What an unfortunate time for a ballpoint pen to stop working! Just as you round off the eastern reaches of an A you hit an air pocket. And bumph. Instead of buying "Apple Sauce" you get funny looks as you wander the aisles trying to buy Cripple Sauce. What would cripple sauce be? Part of me thinks it's some kind of super-hot chilli sauce like Dave's Insanity Sauce, or my personal favourite - Dragonfart's Wet N Reddy BBQ sauce. That stuff could strip wallpaper. And "hi", straight back atcha. Oh, and you'll be paid next week, if that's okay? Thankyou! Mr Foster is a kind-hearted gentleman. 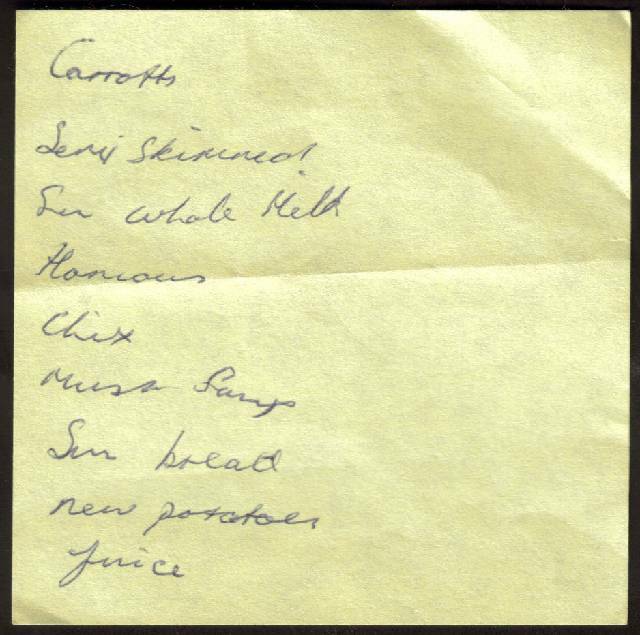 I doubt this is the first time he has gone shopping for bulky goods on behalf of the list-writer, as in order to complete the shop he needs an intricate knowledge of list abbreviation. "K. Roll" and "Mr. 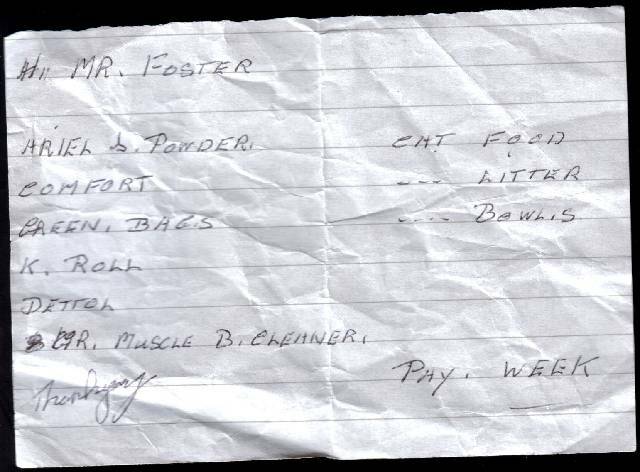 Muscle B. Cleaner" are, one would have thought, easy enough to decipher, but in the curious world of the list this is not always the case. The interesting ditto marks under "Cat" are also worthy of a mention. An ellipsis (three dots) is usually used in speech to indicate a pause or an intentional omission in text; indeed, the word itself comes form the Greek for 'omission'. So why shop for "...litter" or "...bowls". It can mean only one thing. The list-writer meant to use ". Simple, really. It all starts with fruit ("Bananas" and "Lemon juice") and finishes with dairy - "Milk" and "Yoghurts". Alice likes this list. She reckons you could make something with the "lemon juice", "flour" and "eggs". In fact, they do. Add these together with the "milk" and you've got instant pancakes. Well, not quite instant, but pancakes nevertheless. "Plain flour" and "Yeast". I thought I was onto it. Really, I did. I thought it was some kind of pie. Especially as "Scale" features somewhere further down the list, perhaps a single weighing scale to measure out the ingredients for the aforementioned pie. But perhaps not. Indeed, I've never come across a garlic and olive pie, and nor do I particularly want to. Part of me thinks the secret to this list lies in the right-aligned item, but I can't decipher it. "2 pin frankfurther" perhaps? "2 pin lighter"? I really haven't got a clue, but some anonymous commenters do. They've worked out that it's actually a "2 pin adapter". That certainly makes more sense than my own suggestions, but still doesn't help with the confusion around the pie. Oh well! 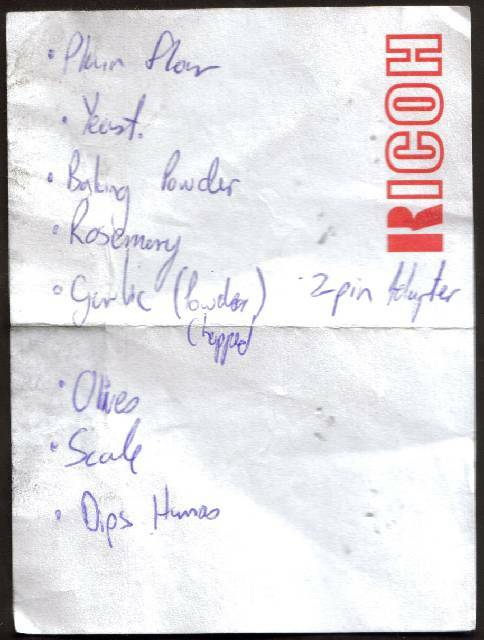 This site is made possible by the kind people who abandon their shopping list at the end of a trip to the supermarket. I collect those shopping lists. You might refer to these as grocery lists, which strikes me as a bit strange because not all the items on the lists are groceries. Anyhow, I won't worry myself about it if you won't. For those of you who have asked why I do this, please just be content with the fact that I do. 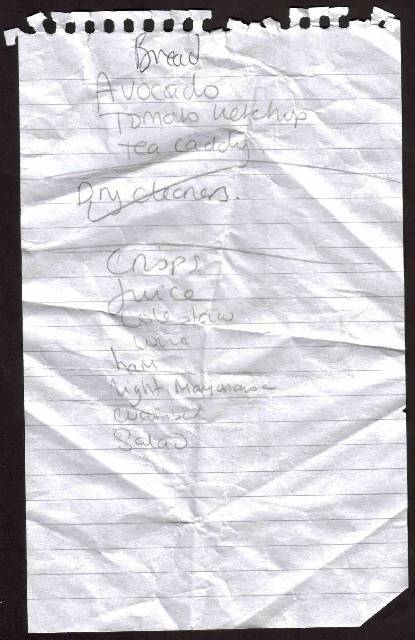 I saw a list lying abandoned in a trolley once, and thought, "I'll have that". So I did. 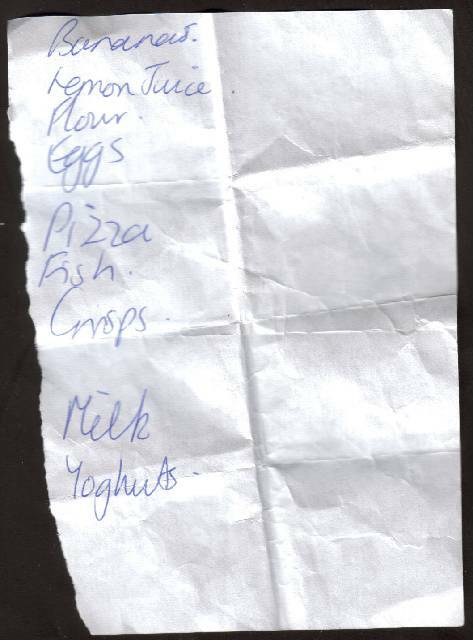 Each shopping list I find is added to my collection along with comments about each list, which usually consist of me spouting on about the possible personality of the person who wrote it. I'm quite harsh at times, at others I feel a pang of compassion. Sometimes I just don't know what items are. Hopefully it will aid your procrastination.